Some of the latest news from Lancaster Vision and from the Lancaster District and surrounding areas. The Expo marquees set up beside The Brewery in Lancaster Leisure Park were an impressive sight, with an interior as colourful and varied as a mediaeval market place. There were 100 stands, each with its own corporate colours and logos, leaflets and fliers, with the stall holders jostling for attention and trying to capture the eye of the passer-by who might turn out to be a future valuable customer or contact. Most of the stands offered freebies, especially on the Sunday, the family day, when the freebies seemed to consist of limitless sweets and other unhealthy attractions. We felt proud of the Lancaster Civic Society/Lancaster Vision stand with its newly acquired pop-up banner, corporate table cloth on the stall and display panels setting out our aims and achievements in words and pictures. These are assets which can be used to promote the organisation at a range of events in the future. We felt we managed to look both professional and relevant, and we were able to offer the public leaflets with information about both the Civic Society and Lancaster Vision, others showing the work of the Civic Society with the forthcoming programme, and plenty of opportunity to discuss what we do with the public. We felt we had taken part in a very successful event – the Chamber of Commerce had worked extremely hard to achieve this – and that our group had its own successes. We had almost 100 interested people stop at the stand over the course of the event, with only a fraction fewer on the Business-to-Business day (the Monday) than on the family day. We also offered people the chance to keep in touch with us through our newsletter sent via email, and over 20 took us up on that. We hope that some of these will be future members. We have to thank all the volunteers from within the society who gave their time and skills to making our stand a success. Having had it once we look forward to the promise of another Expo next year. The Bay Arena in Morecambe is one of 15 projects along the British Coast set to benefit from a share of £700,000. Coastal Communities Minister Mark Francois has announced that the projects – dotted across the country from Durham to Dorset – have been awarded up to £50,000 each to help restore local landmarks to their former glory. 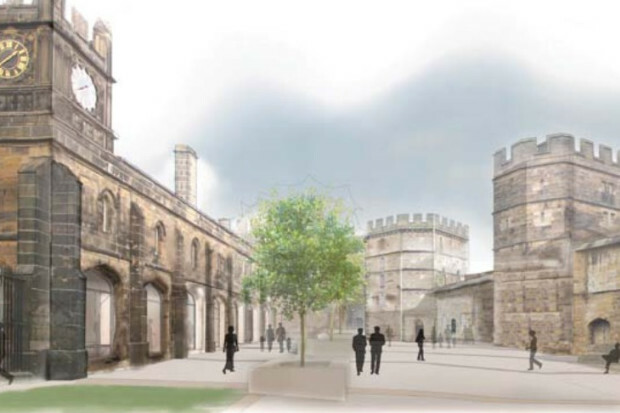 The Duchy of Lancaster has revealed new plans which will transform the courtyard inside Lancaster Castle and see the demolition of the current cafe building. The Lancaster Vision group held a seminar to discuss Lancashire County Council’s draft masterplan for the district. A report was then produced based on feedback from those in attendance.